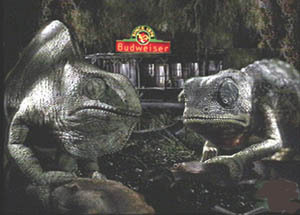 The Budweiser Lizards Page. Hear the full audio files of all 20+ adverts, most never seen in the UK. Laid out in story fashion, the audio files are both Realaudio and wav files. You will need Realplayer to hear the majority of them. You can get Realplayer by going to my "Cool Links" section. If you are a player of "Age Of Empires" or "Rise Of Rome", this page is for you. Here you will find a few scenario's to download, info on the "Warlords Of Atlantis" online gaming clan and plenty of links to some excellent game related sites. The Fish tank. Everyone that looks into a fish tank sees what they want to see. Here is where I voice my opinions and beliefs on all kinds of subjects. Has man really walked on the moon? Did we evolve or were we created? Is there Loch Ness Monster? Links to other sites worth looking at. These Pages are some of my favorites and I visit them regularly. Whether you are after pages for Fonts, Gifs, Game Demos & Tips or looking for software Like ICQ & Realplayer, here's where to find them. If like me you enjoy midi files or wish to use them on your web site, here are some of the best I have found. Be aware though, A midi file is only as good as the soundcard in your computer. On a good quality soundcard these midi's sound excellent. Are you thinking of building or updating your web site? If so, here are a few "Themed" page sets you may find useful. Backgrounds, Link Buttons, Welcome Signs, Bullets and Icons all designed to create a feel to your pages. Jokes, Quotes and Mis-Quotes, Funny Insurance Claims, German-English Road Terminology. These pages are here purely to give the reader a good laugh. Hopefully, will be updated on a regular basis. You'll also find the pages that didn't fit any other catagory on this page. Okay, so I had to include my business on my site. Amongst other things Demon Designs produces quality Business Stationery, Key Fobs, Promotional Playing Cards, Diaries, Greetings Cards, ID and Membership Cards, Calenders, Leather Bookmarks, Lighters, Pens and Tax Disc Holders.